With two runways and three terminals, Manchester Airport is the go-to airport for many travellers flying from the North West of England. And adding airport parking from APH is the perfect way to ensure a seamless start to any trip. Here at APH, we’re proud to offer a full range of Airport parking options to serve passengers heading to more than 200 destinations around the globe. With off-airport, on-airport and meet and greet services available, there’s a solution for all. We’ve also put together a varied selection of Manchester Airport hotel and parking packages to help ease the anxiety and stress that can sometimes strike as passengers struggle with early morning flights and congested journeys to the terminal. Travellers can rely on APH to help ease departure day anxiety, by offering the best parking services for their individual needs. From the likes of official Manchester Airport Long Stay Terminal 1 and Terminal 3 and Terminal 2 and Manchester Airport Short Stay covering Terminal 1, 2 and 3, to cost-effective park and ride options including our very own award-winning APH Car Park. 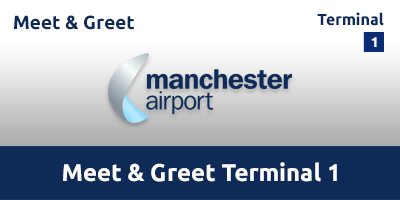 Along with on- and off-airport parking, APH offers official Manchester Airport Meet & Greet, with services covering all three terminals. No need to run the risk of leaving your car with street-parking rogues when you book official meet and greet parking through APH! Use this guide to help find the Manchester Airport car park that’s right for your next holiday or business trip. With airport parking industry experience spanning four decades, you can rest assured APH only offers services from reputable providers who adhere to the stringent standards we demand. With three terminals and just as many types of parking on offer, securing the correct service for your trip can prove a little hit and miss. Fortunately, we can help guide you through the booking process with ease and speed. Millions of air travellers rely on airport parking each year – and the insatiable demand for space makes it an attractive target for unscrupulous ‘operators’ looking to earn easy cash – at your expense. This is why the Park Mark Safer Parking Award is such a vital tool. It’s easy for rogues to hide behind smart-looking websites, but creating the physical infrastructure required for a legitimate, security-protected car park isn’t so simple. In fact, many such meet and greet ‘providers’ settle for street parking or unguarded public car parks. As a Police Crime Prevention Initiative, the Park Mark Safer Parking Award is intended to help cut crime and the fear of crime in car parks across the UK. The scheme also covers facilities at Manchester Airport. Take a look at the Manchester parking services we offer – such as APH Car Park Park & Ride – and you’ll see all are recipients of the Park Mark Safer Parking Award. The Safer Parking Award is only bestowed on car parks that meet or go beyond the requirements of a risk assessment set by the police. Keeping safe is easy when you book with APH. Along with the Park Mark Safer Parking Award, travellers have a powerful tool in the form of user-generated reviews. That’s why APH puts independent customer ratings at the centre of our website and the products we offer. We think it’s essential that travellers from Manchester Airport can see genuine, independently curated reviews and ratings for all the parking products we offer and provide. Take a look at the reviews created by genuine, verified customers through independent ratings firm, Reevoo, and you’ll see why APH is a multi-time winner of the Best Airport Parking Company category at the British Travel Awards. 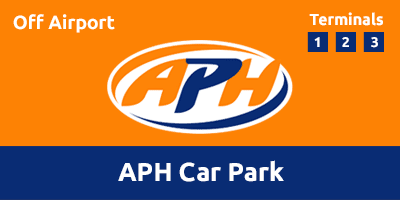 See just why more than 28,000 verified, genuine customers have rated APH Park & Ride at over 9.3 out 10! And we don’t just pick the best reviews either – as an independent provider, Reevoo publishes all ratings without interference. You can rest assured that you’re getting the full picture with APH. You’ll find Reevoo customer ratings for every parking product we offer – from park and ride to official on-airport facilities and meet and greet. With APH you’re in control! As a multi-terminal airport, passengers need to book the correct parking to ensure they arrive at the check-in desks in plenty of time. Here at APH, we can help select the perfect provider for your Manchester Airport parking and departure terminal. 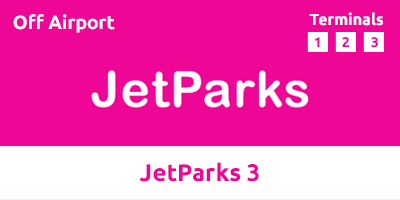 For passengers choosing off-airport parking, the likes APH Park & Ride and Jet Parks 2 and 3 can be selected for flights departing from all terminals. However, many official on-airport parking and meet and greet services are terminal specific – so be sure to check our guide to services offered for Manchester Airport Terminal 1, Terminal 2 and Terminal 3. Along with information directly related to picking airport parking, you’ll also find insider guides to essential services found within the terminals. From how much change you’ll need for baggage trolleys, to searching out the best restaurants for a pre-flight pit-stop we’ve got the details you need. You can rely on APH to provide safe, security-protected airport car parking, but that doesn’t mean you’ll need to pay a premium for this peace of mind. We also appreciate the importance of providing hard-pressed travellers with value-for-money services. That’s why booking with APH always brings the best in airport parking at a price to suit all budgets. The cost of parking at Manchester Airport is not set across the year! Peak season sees demand rise and the same will inevitably happen to prices! However, there are plenty of other factors that influence what you’ll pay – and APH can help savvy travellers gain significant savings. Here at APH, our priority is to ensure you get the best airport car parking at the best prices! That’s why we’re happy to share our ‘market intelligence’ to help you secure potentially huge savings on the cost of parking for your trip. Crunching the figures, it’s clear to see that booking early can cut significant amounts of cash from your parking bill. If your travel plans are set early and unlikely to change, reserving on-airport, park and ride or meet and greet parking right away could prove a smart move. 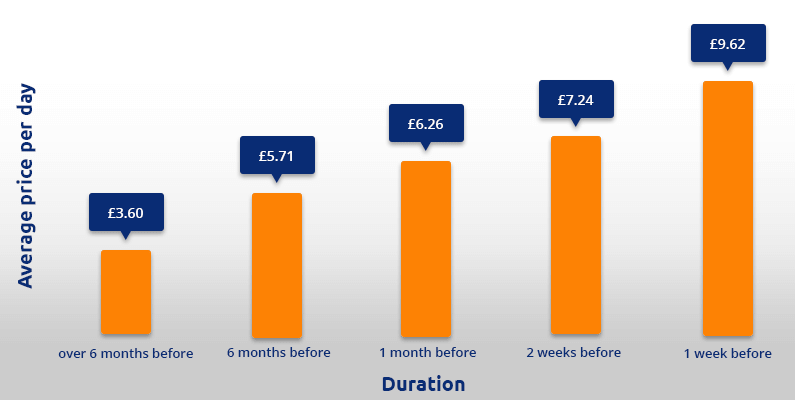 Using our data, you can see that booking six months ahead of departure day could potentially cut a jaw-dropping 60 per cent from the purchase price compared with making the same reservation a week before you’re due to fly from Manchester Airport. Putting this cash terms, an average week’s parking could cost around £77 when booked a week before you leave, whereas securing the same space six months earlier could reward you with a bill of around £29. So, if a saving in the region of £48 is tempting – you know what to do. Another great way to the reduce the amount you’ll pay for Manchester Airport parking is to pick non-flex deals. Looking at a week’s parking in November, booking a non-flex deal at APH Car Park, Manchester Airport will cost £51.45 compared with a flexible package at £55.92. Just make sure your travel plans are set in stone before booking non-flex, because you won’t be able to change the time and date once you’ve paid. But, if you’re sure, non-flex is just another great way to ensure more cash stays in YOUR pocket. Typically, booking park and ride services – such as APH and JetParks 2 and 3 – will offer the cheapest prices. So, if taking a few minutes on a transfer bus doesn’t bother you – this easy-to-use service will help cut costs for all types of travellers while ensuring vehicles are left in safe, security-protected compounds at all times. If you want cheap Manchester Airport parking then head to APH Car Park for the best in secure parking and typically the cheapest service we have on offer. Get a quote now and relax in the knowledge your car’s under our watchful eye 24 hours a day. Travellers flying from Manchester Airport have a wide range of parking products to choose from. Unlike some smaller airports, passengers heading for the Manchester check-in desks certainly won’t have to make do with a one-size-fits-all solution for their parking. From our very own award-winning APH Park & Ride for off-airport parking to official Manchester Airport LongStay, MultiStorey and Meet & Greet products covering all terminals, take a look at what they offer below to help you choose the service for your trip. Take a look at this easy-to-read overview of how Manchester Airport parking works and see just how it can work best for you. 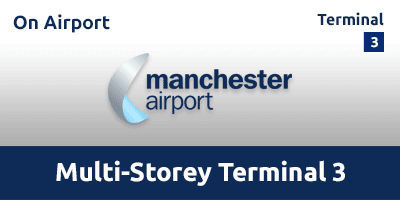 On-airport parking provides a fast and easy route to the terminal doors when booking Manchester Airport parking. Here’s a little more on how this parking service works. 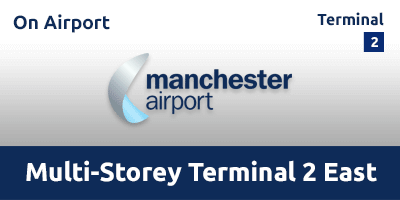 Arriving at Manchester Airport, drivers will head to one of the official LongStay or MultiStorey car parks. The car parks are terminal-specific, so care must be taken when booking and arriving at the airport. LongStay T1&T3 operates alongside LongStay T2, with MultiStorey T1, MultiStorey T2 and MultiStorey T3 covering off all Manchester on-airport parking options. Picking this type of parking can save time when flying from Manchester Airport, with the MultiStorey car parks just a short walk of 2-5 minutes from the check-in desks. The official LongStay car parks require a short transfer bus ride of 5-10 minutes. Passengers using these services park their own car, so there’ll be no need to leave the vehicle’s keys behind when they travel. On-airport parking is easy to use, too. Just head straight to the car park, find a space, park, unload bags and take the short walk or transfer to the terminal doors. Best for: The ideal service for travellers looking for a fast getaway. No need to navigate to off-airport car parks – just head straight to the terminals. On-airport parking makes a smart solution for business travellers, with no need to waste time with transfer buses getting to and from the car park. Users can expect to be charged a little more for this type of parking due to its proximity, but for many it’s a small price to pay to help ensure a stress-free getaway from Manchester Airport. If you’re looking for a great deal on airport parking that doesn’t compromise on location and security, then take a browse through the off-airport options we offer for Manchester Airport parking. With the likes of the award-winning APH Car Park and Jet Park 2 and 3 on offer, it’s easy to ensure your car’s safe at a price that’s sure to impress. Choosing this cost-effective parking won’t mean compromising on safety either. With the police-approved Park Mark Safer Parking Award bestowed on all off-airport car parks we offer, car owners can be assured of extensive security measures including security barriers, CCTV and manned patrols. Picking off-airport parking is simple – with the services we offer providing transfers to all three terminals. And, with journey times of no more than 20 minutes, they’re all within easy reach of the check-in desks. Travellers using the APH Car Park will enjoy the luxury of having their cars parked for them, while Jet Parks operates a self-park system. 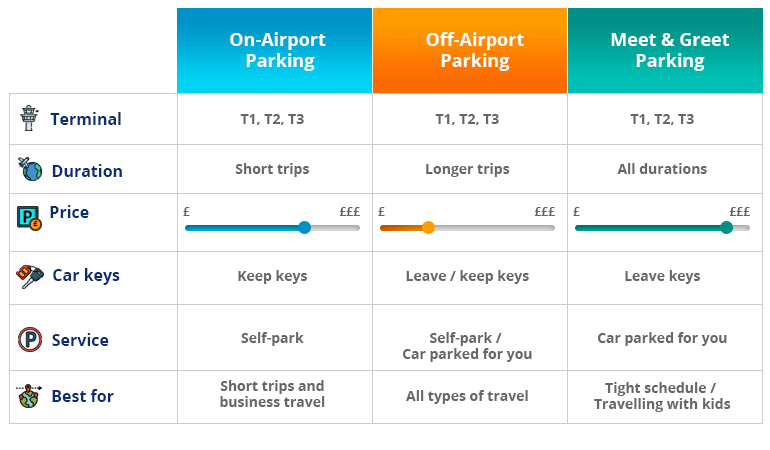 Here’s a simple visual overview of how off-airport parking works for passengers travelling from Manchester Airport’s three terminals. This is a brief overview, but you can click through to individual products for a more detailed description. Best for: Anyone searching for cost-effective parking that doesn’t compromise on location or security will be well-served by off-airport options offered by APH. Ideal for all travellers flying from Manchester Airport, the likes of APH Car Park and Jet Parks offer parking you can trust at some of the best prices available. 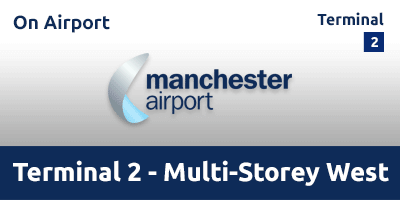 Looking for a little more from your Manchester Airport? Meet and greet could be the solution you’ve been searching for. There really isn’t a faster way from car to check-in desk. Forget the stress of bus transfers or hunting down for spaces in busy airport car parks – simply drive to the terminal, unload your bags and head straight in. You car will be parked in a security-protected car park by a fully insured chauffeur. Forget the horror stories of rogue operators parking cars on streets or illegal compounds in muddy fields, APH only works with official Manchester Airport Meet & Greet. Travellers using these services can travel with confidence, safe in the knowledge their vehicles are parked in the airport’s security-protected car parks for the duration of their trip. With services covering all terminals, take your pick from the top-rated Meet & Greet Terminal 1, Meet & Greet Terminal 2 and Meet & Greet Terminal 3 to get your trip off to the jet-set start you deserve. Forget the transfer bus – your holiday starts just seconds from the terminal doors. Here’s a quick overview of how meet and greet parking works for you. Meet and greet might be considered a premium product, but prices certainly aren’t prohibitive. Typically, booking Manchester Airport Meet & Greet will cost no more than the official on-airport parking. Best for: Travellers with young kids or bulky bags will find this service particularly useful, as will those flying on business trips. It’s great for anyone running to a tight schedule, too, with no need to hunt out parking spaces or queue for transfer buses. Travellers can expect to slash up to 45 minutes from their trip to the terminal doors. Getting to the terminal on time can result in a stressful departure day – with this a particular problem for travellers departing on early morning flights from Manchester Airport. With this busy international airport fed by some of the most congested motorway sections in the UK, it’s all too easy to suffer the effects of rush-hour delays or unexpected road closures. There is an alternative, though, with many savvy travellers choosing to cheat the jams by arriving the day before their flight and pairing airport parking with a night in a nearby hotel. Swap early morning alarms and rush-hour snarl-ups on nearby motorways for a relaxed night’s sleep and leisurely breakfast before taking a short transfer to the nearby terminal or car park. Booking a hotel and parking package isn’t just a pricey perk for folk with cash to spare, though. Check-in at the Britannia Airport Hotel packaged with APH park and ride, and you’ll pay just a few pounds more than parking alone. Want to join the smart travellers who are already swapping rush-hour for a relaxing night at a nearby airport hotel? Find out more about the hotel and parking packages on offer now. Get ready for your trip from Manchester Airport by preparing a route your car park or meeting point. Just use the map on this page to ensure you’re at the check-in desk with plenty of time to spare.